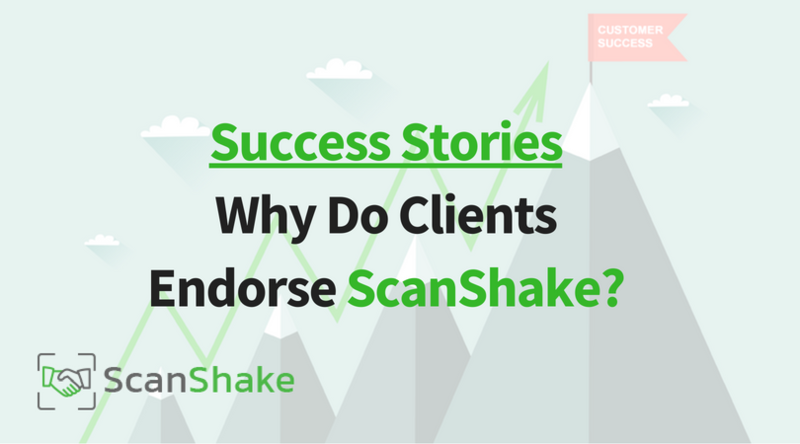 Success Stories: Why Do Clients Endorse ScanShake? Customer success is extremely important to us! This is why leaving a positive impact on our clients and their exhibitors further fuels our commitment to ensuring that our resume capturing mobile app continues to make recruitment more powerful than ever before. We’re passionate about making ScanShake your favorite tool which is why we’re here to share testimonials from actual users that were able to overcome their hiring obstacles using our sleek solution. Having powered the Career Fair 2018 for University of Maryland University College (UMUC), the ScanShake team had the privilege of meeting many recruiters, hiring managers and executives like you in search for top talent. Using our mobile app to overcome the perils of tedious and monotonous resume sorting, short-listing, exhausting physical event attendance and more, here is some feedback from satisfied users that we are proud to share. An innovative and customizable mobile solution, the cutting edge convenience of ScanShake makes recruitment simple without compromising on efficiency and functionality. Using the app is an effortless process: exhibitors just have to scan the unique QR code generated by ScanShake’s Visitor app to instantly capture job seeker details. No paper-based exchanges, risk of losing resumes, or need for time-intensive application sorting to shortlist promising prospects makes it easy to build candidate pipelines that are searchable, organized and easy to share with your team for flexible collaboration. It’s not just the hosts and exhibitors that benefit from this nifty technology; job seekers and event visitors receive the exhibitor’s digital contact card after every scan of their QR code to make post-event follow-ups a super smooth experience. Eliminating the need to carry around a cumbersome pile of employers business cards, ScanShake makes career and job fair participation liberating and convenient for all. What truly makes ScanShake unique is that it not only adds value by saving time traditionally lost in slow information sharing, but allows clients to promote their brand, and build appeal as an industry leader and employer-of-choice. Delivering an excellent user-experience, hosts get to enjoy seamless registration via beautifully designed custom landing pages. Having utmost control over data they want to gather from attendees, the registration form is a great avenue to accomplish post-event trend analysis based on visitor attributes such as qualification, work experience, nationality, etc. Attaining measurable results to assess event impact is no longer difficult. Using ScanShake to identify most active job seekers, exhibitors with highest scanning frequency, total resumes captured and attendees most visited booths are just a few of the metrics that our mobile app helps monitor to help bump up your ROI. Offering both iOS and android compatible apps to cater to all exhibitors and event guests, ScanShake is the key ingredient to drive recruitment success with our support team working around-the-clock to streamline your most unique challenges. Being able to track candidate quality and diversify talent pool helped UMUC transform the career fair experience for its partners. Meanwhile, exhibitors were saved the trouble of walking away with mental notes and fragmented recollection of candidate conversations. Instead, ScanShake enabled them to add searchable tags and “star profiles” to mark exceptional talent without risk of losing their favorite prospects to competing businesses. Adding focus and consistency, on-the-spot shortlisting candidates for vacancies is just one of the highlights that has earned us the reputation as one of the best applications to spearhead recruitment targets for organizations. Make your next recruitment event stress free; tailor the app to match your needs and help your guests experience the wonder of future-proof hiring technology. Manual resume collection, sorting and management damages productivity, slows down workflow and weakens your talent acquisition strategy- a major red flag for businesses with high vacancy volumes to fill and business growth to support. ScanShake helps you stay on track with seamless recruitment, thus making it our client’s preferred mobile app for career and job fairs. Experience the convenience and ease for yourself, schedule a demo today and see how the ScanShake team can make your next event a success story you’ll be proud to share.